Chances are you’ve never heard of it! Despite being labelled ‘the biggest medical breakthrough of our lifetime’ very few health care professionals have either. And yet scientists at the cutting edge are really excited about it, and it is one of the fastest expanding fields of science…..
We all make redox molecules within every cell of our body and they are fundamental to not just health, but life! You see, although you feel like a coherent whole, you are, in reality, a colony of trillions and trillions of cells that have all decided to specialise (heart, liver, skin, brain etc) and come together and work harmoniously to form the miracle that is you! cope with stress and even to a strengthened sense of purpose and of self. Their effects are far reaching…. And as we age, are stressed, ill, exposed to toxins our ability to produce these tiny molecules becomes impaired – our memory isn’t as good, our thought processes not as clear, our energy not as good, our sleep not as refreshing, our ability to heal much slower. Everything becomes much harder work and health niggles start to take hold, developing into chronic disease pictures. But put these molecules back in….boost your levels up once more….and wonderful things happen. I have both seen – and heard – stories that are little short of miraculous in the effects these molecules have on even the most serious health conditions. I will freely admit, I was sceptical at first, then I started using them for myself, my family and then my clients. Now I’m a total convert! I want to live to a riotous and fun-filled old age, I have so much to still do and learn about and share….and being able to supplement my levels of these molecules will ensure I do! Click here to learn more about Redox Skincare and see the amazing results it gives! 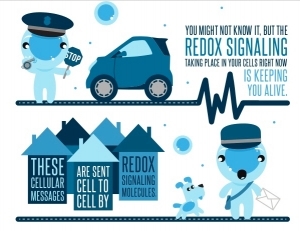 Click here to buy the world’s ONLY Redox product. This link will open an external site in a separate window.